Downland Crafts is looking for enthusiastic stampers to join our team of elves. We’re looking for crafters who love stamping, have an active social media presence and can take great photos. If you have a craft blog or you tube channel as well that’s a bonus. We are based in Ireland but welcome applications from anywhere in the world as you may know our Chief Elf Tanith lives in Cyprus. We’re looking for a variety of styles and abilities to showcase our stamps in as many ways as possible so we want to hear from new crafters as well as seasoned professionals. Our main focus is on card making but if you use stamps for any other crafts we’d be interested to know more. To create at least 2 projects a month using our stamps which you will promote on social media and your blog if you have one. To send us good quality photos of your projects and allow us to use them for promotional purposes. To become an active member of Downland Crafters our Facebook customer group and share your makes with the group. Free stamps to create your projects. Your work showcased on our website, social media and in our newsletters. Your own unique discount code to use for your stamp purchases on our website and to share with your followers. A copy of our logo and a text ‘sticker’ to add your posts and/or blog. The option to be a guest blogger on our website. 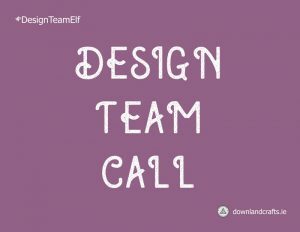 It’s our 8th birthday in a month’s time so if you’re interested in becoming a design team elf then simply make us a birthday card using any stamps of your choice and send it along with your name, email, location and short bio to designteamelf@downlandcrafts.ie be sure to include any links to your social media pages and blogs. We’ll contact the successful applicants within 2 weeks after the closing date 15th July, 2018. We’re really excited to see what you make, good luck and thank you in advance for the birthday wishes.